Throughout the year, POPCS Middle School students volunteer at the Seven Loaves Food Pantry in Plano. 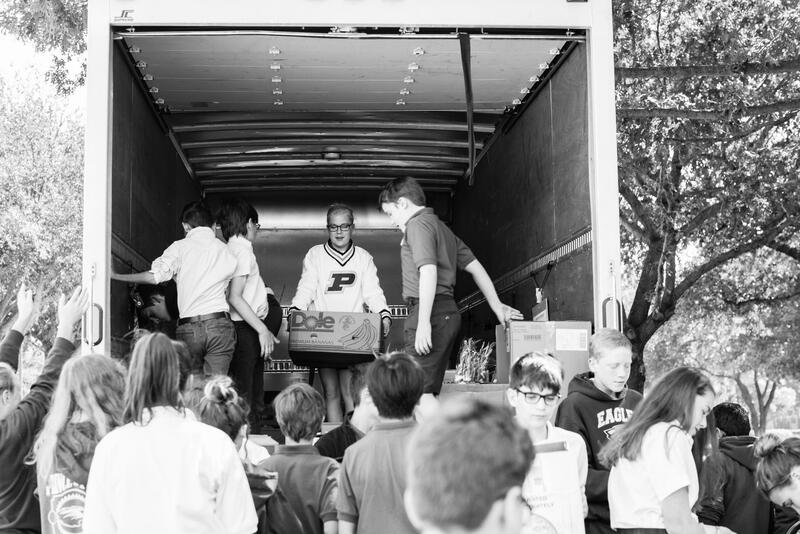 Every Thursday Middle School students serve by organizing donations, setting up tables and chairs, and preparing the pantry for families that need their services. We are blessed to have this opportunity to serve others at Seven Loaves! Optional enrichment trips are available throughout the school year with additional fees. Sign-up information is available in the Middle School office. Contact Middle School Assistant Merrie Buono, 972.598.1062. Prince of Peace Christian School has a chapter of the National Junior Honor Society (NJHS). This nationwide organization recognizes student accomplishments in the areas of leadership, character, scholarship, and service. Students may apply during the spring semester of their Grade 7 year. A committee of teachers and sponsors review each application. For more information, contact Middle School NJHS Coordinator Marianne Schnell. Students completing Grade 8 will participate in a recognition celebration on Thursday, May 23, 2019. The ceremony honors Grade 8 graduates for their accomplishments and allows their families to share this special milestone with them. The class valedictorian and salutatorian will be presented, and all students who meet the requirements will receive a certificate. The Learning Lab provides Middle School students who are diagnosed with learning differences the opportunity to work in a small group setting. The students must have (within the last 3 years) professional testing and paperwork outlining their academic needs. The Learning Lab focuses on completing class work, reviewing for tests, reteaching concepts as needed, and breaking down class projects into smaller parts. Contact POPCS MS Learning Lab Coordinator, Karin Rogers for more information. To prepare a student for service and success, Prince of Peace Christian School considers the whole child's well being as a part of our exemplary education. School Counselor Michelle Dwyer and Gary Prindiville seek to provide daily support and resources for mental, emotional, wellness, and spiritual health for POPCS students, families, and school personnel. Should your child need mental or emotional support, they are happy to walk alongside them through any struggles they might be experiencing. Mrs. Dwyer and Mr. Prindiville are certified School Counselors. Mrs. Dwyer is currently working on her certification as a Family Life Educator and Mr. Prindiville is working toward licensure as a Professional Mental Health/School Counselor for the State of Texas. Care and Concern Counseling is available for Lower, Middle, and High School students. Please contact Michelle Dwyer and/or Gary Prindiville for information. The Care and Concern Counseling office is located in the Fine Arts Center hallway near the art studio, the direct line is 972.598.1118. We are pleased to partner with Flik Independent School Dining (FlikISD) as our on-site lunch provider. Flik prepares fresh food each school day in our beautiful POPCS kitchen and dining hall. Chef Christopher and his staff offer healthy, nutritious (often locally sourced), and nourishing food and is committed to building strong bodies and sharp minds. The Flik meal plan is included in the POPCS cost of tuition. With an eye for innovation and detail, Flik serves the POPCS community with campus-wide nutrition programs that educates and encourages students to make lifelong healthy food choices. Students with special culinary needs have access to talk with nutritionist or Chef Christopher about accommodations to provide safe offerings. Check out our POPCS School Menus and learn more about Flik Independent Dining Services. All sports are available for students in Grades 6-8. If the season has begun before a student is accepted to POPCS, he/she will be allowed to participate in a sport if roster space is available. If you have any questions about POPCS Athletics, please contact Middle School Athletic Director Chad Henke at 972.598.1069 or POPCS Athletic Director Earl Garland at 972.598.1093.